Labor Day seems like an especially relevant source text for Reitman to adapt and hit his highest note as a director. It’s a tale of a boy growing up and coming of age during the fateful Labour Day weekend of 1987. The boy, Henry (played by impressive newcomer Gattlin Griffith), lives with his divorced mother Adele (played by Kate Winslet… more on her later), in their large, lonely, and somewhat decrepit suburban home. The tale is narrated in retrospect by an adult Henry, who is voiced and played by Tobey Maguire. Henry is all Adele has, as her she fell apart in the years surrounding her divorce: Henry has no idea of his importance to Adele, but his love for his mother feels threatened when he invites a stranger named Frank (played by Josh Brolin… more on him too) into their home. Frank, an escaped convict, stays with Adele and Henry far longer than expected after he coerces them into giving him a lift from the discount store during one of Adele’s rare trips into town. The Joyce Maynard novel has an especially delicate tone and a tricky balance of humour and peril as Henry, Adele, and Frank find love and friendship in this unusual encounter. Labor Day, the book, is like a beach read with the substance of a classic as Maynard unfolds the story in lucid prose that’s warm and inviting in spite of the darkness underlying the tale. It’s this balance and tone that Reitman both recreates and furthers as he brings Labor Day to the screen. Equally remarkable at handling Labor Day's ability to move a viewer from tears to laughter are the three stars of the film. Griffith carries the film extremely well. It's no easy task for a young newcomer to play the lead in a film of such emotional complexity but Griffith delivers a compelling and believable arc as Henry experiences the strange and confusing odyssey of watching his mother fall in love—and, in his mind, betray him—with the man who interrupts their innocent relationship. Winslet is similarly, if not exceptionally, remarkable in the tricky role of Adele. Adele, on paper, isn't too distant from some of the other bored, lonely suburban housewives and mothers Winslet has played in Revolutionary Road, Mildred Pierce, and most notably, Little Children. Winslet, however, brings a different facet to her heartbreaking turn as Adele. There's a hunger and moroseness to Adele to we haven't seen in Winslet before. Adele seems almost lifeless, dead on the inside, as she moves throughout the house and hides in her car or frumpy clothes in the introduction or flash back scenes of Labor Day. Winslet brings a spark to Adele whenever Henry is in the room: the only thing keeping Adele alive is her unwavering love for her son. It's not enough, though, as Winslet shows Adele transform as her maternal instinct slowly allow her to trust Frank and she lets her guard dorm to invite him into her home and heart. Winslet gives a performance of subtle and devastating power. Brolin gives an equally praiseworthy performance as Frank. It isn't clear at first if we can trust Frank as he wears a smile and reassures Adele as he ties her and Henry to a chair. Brolin’s Frank is kind and instantly likeable, and like Adele, the necessity of building a relationship with his hosts is palpably clear. Reitman gradually builds the audience's allegiance to Frank as he methodically flashes back and reveals the story behind Frank's incarceration. The memory is delivered in a single blow in Maynard's novel, but Reitman disperses the tale throughout the adaptation and adds another layer to the delicate, complicated narratives of these flawed and relatable characters. The flashbacks develop Adele's desperation in turn, as Frank's young lover shares a striking physical resemblance to Miss Winslet. It takes several returns to decipher which of the lonely hearts is being revealed onscreen. The flashbacks complement either story, though, as the images of young lovers and blossoming love speak to the absence felt by Adele and Frank before their encounter. Reitman's take on Labor Day is both an unsettling and cathartic take on suburban malaise. His depiction of the odd surrogate family of Henry, Adele, and Frank takes the underlying darkness of the tale and moulds it into a look at one's perception of how one defines success and happiness, for better or for worse, through the family. It’s the evolution of his cynical black humor one could say. “It’s all about keeping up appearances,” Frank says, as he binds Adele to a chair and feeds her dinner—an unusual first date. Adele’s sense of self, her satisfaction with life disappeared when her first marriage dissolved, but she finds happiness again by reconstructing a family to provide the best life she can for her boy. 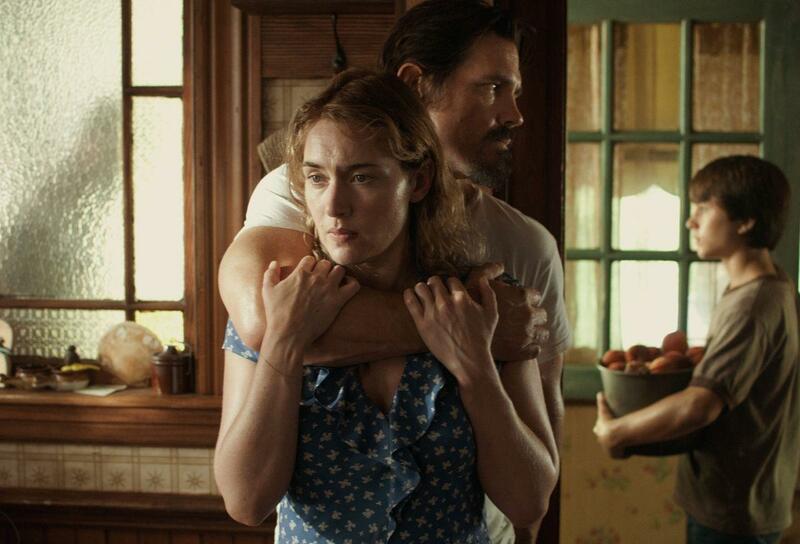 Take one especially beautiful scene in Labor Day, both the film and the novel, in which the makeshift family bonds over a collective baking session of Frank’s mother’s recipe for peach pie. This sequence marks a turning point for everyone in Labor Day—both on front of the camera and behind it—as the tension melts with the butter in the oven and Frank address a rather role. There is a warmth to the scene in between the winning performances and the gorgeous cinematography by Eric Steelberg that captures the soft natural light glistening on the peaches. It’s the sense of belonging that rises to the surface of this scene as Adele and Henry display their first moment of genuine happiness in the film. The domesticity of the scene is almost romantic and out sets up the bittersweet tragedy that is to come. Labor Day easily stands out among the films at this year’s Toronto International Film Festival. Not only is it sure to be one of the best of the fest, but the year as well. Labor Day screens again Saturday, September 14 at 6:00 pm at Ryerson.